← I am Locutus of Borg. May I take your order? One of the first games I ever played was Star Trek: 25th Anniversary, one of the many gems on the Interplay 10th Anniversary CD that came bundled with my dads Compaq (remember the days when games were bundled?). 25th Anniversary was special in that it combined a “Wing Commander” style combat sim with away missions and mini “episodes” of the original series, kind of like a fourth season. This game and its sequel “Judgment Rites” remain my favorite games of all time and have always found a place on whatever new computer I buy. Through the magic of Amazon I recently acquired an original floppy copy of the game (8-3.25 inch disks) and in today’s edition of AGFV I’ll show you how to install and run this fine game, even if you’re working with twenty year old floppies like me. Step One: The first step is easy, but a little tedious. Copy the contents of each floppy disk into a separate folder (Disk 1-8). This process will remind you of the joys of how long it used to take to write files to and from a disk (and these are only about half full!). Unfortunately you need to use separate folders since most of the installation files are a compressed archive that has the same name on each floppy. 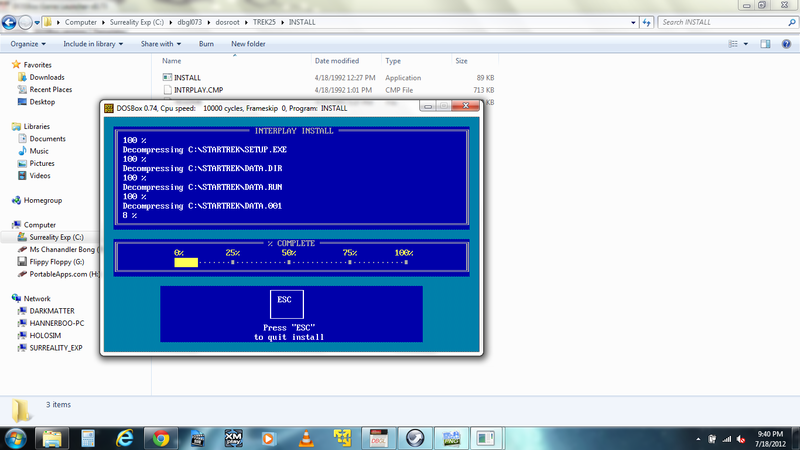 Step Two: When you’re done, create a ninth folder called INSTALL and copy the contents of Disk 1 into this folder. Copy all nine disk folders into a folder called “TREK25” and copy this folder to “DBGL\dosroot”. 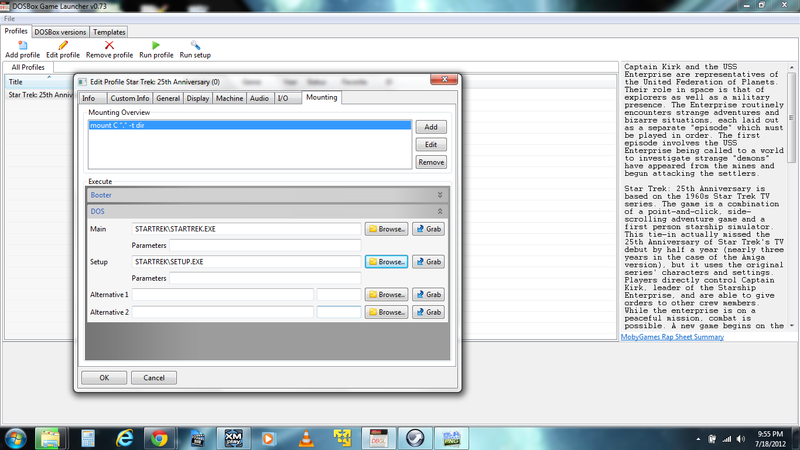 Step Three: Open up DBGL and click “Add Profile”. The first thing you’ll see is a field for title. You should only need to type “Star Trek 25th” then click the “Consult Moby Games” button. A list of possible matches will appear. Select “Star Trek: 25th Anniversary” and click OK. Step Four: Next Step is configuring the machine specs. Click the “Machine Tab” and look at the cycles field. Usually “Auto” is okay here, but 25th Anniversary can be a little fussy if things run to fast or too slow, so 10000 cycles is best. Everything else can be left at the defaults. Step Six: Before clicking OK at the bottom left, Browse to TREK25\INSTALL\INSTALL.EXE for both main and the setup fields. DBGL always requires a program file of some kind to be in the main line before the profile can be created. Click OK to create your profile. Step Seven: Click Run Setup. This will start the original installation program. 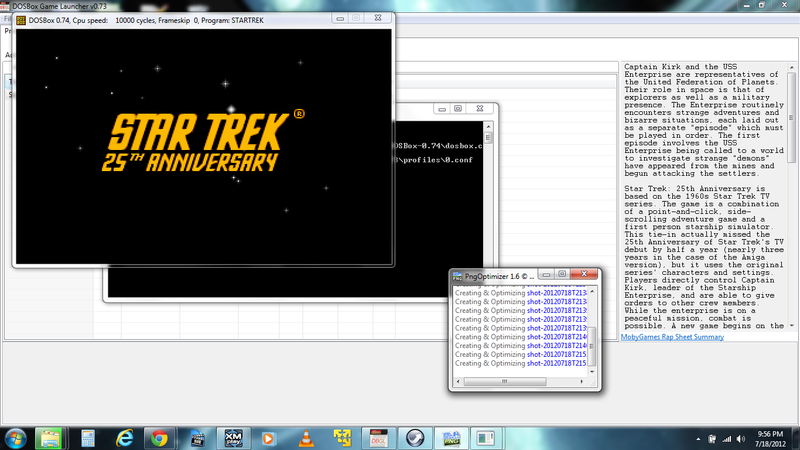 By default the program will save to C:\STARTREK, or in reality DOSROOT\STARTREK. Select VGA, Mouse and Keyboard and Soundblaster for the setup questions, then hit enter to begin installation. Step Eight: Installation will run for a minute or two then ask for the next disk. 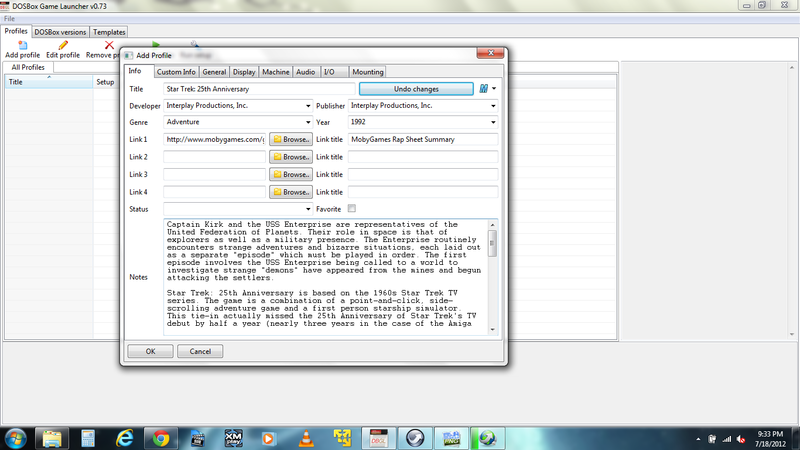 Copy the contents of the corresponding disk into the TREK25\INSTALL folder and press enter to continue. Because we’re mounting this folder as a floppy, changing its contents effectively is like swapping a disk. Typically I just do a CTRL-A to get all the contents of the request disk folder, and then past and overwrite in the INSTALL disk folder. Say yes to an overwrite requests. Repeat for all eight disks (this’ll take 15-20 minutes). 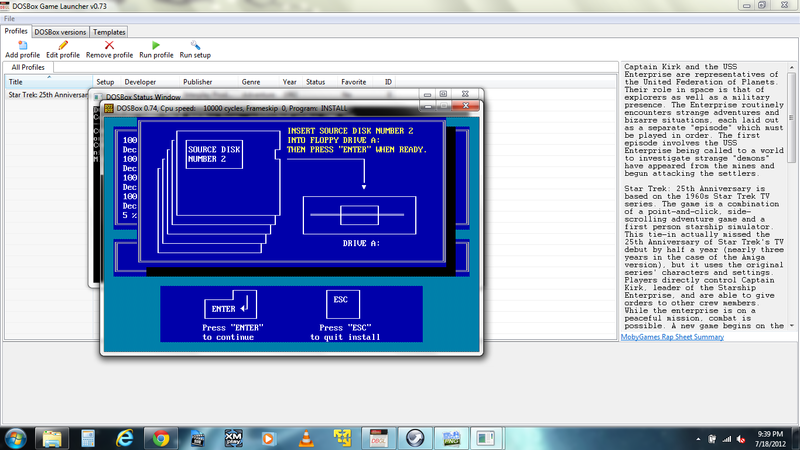 Step Nine: Once installation has completed DOSBox will close. Click “Edit Profile” and click on the mounting tab. Select the floppy mount statement and click remove. Browse to STARTREK\STARTREK.EXE for the main, and STARTREK\SETUP.EXE for the setup. Your screen should look like this when you’re finished (click to enlarge). Click OK to save changes. Step Ten: Click “Run Profile” to start the game (Alt-Enter toggles fullscreen). Below is some gameplay from the CDROM enhanced edition featuring the original voices of the cast. Enjoy! I actually think it’s great that you do these posts. I may not do more than skim them, but I know they exist. And I’ve been known to quote your blog to my husband and completely stun him with my niche-geek knowledge. 🙂 Plus, next time he’s complaining that he can’t install some old game that he’s got lying around, I’ll totally come back here and use this guide to do it for him and win huge super-wife points. 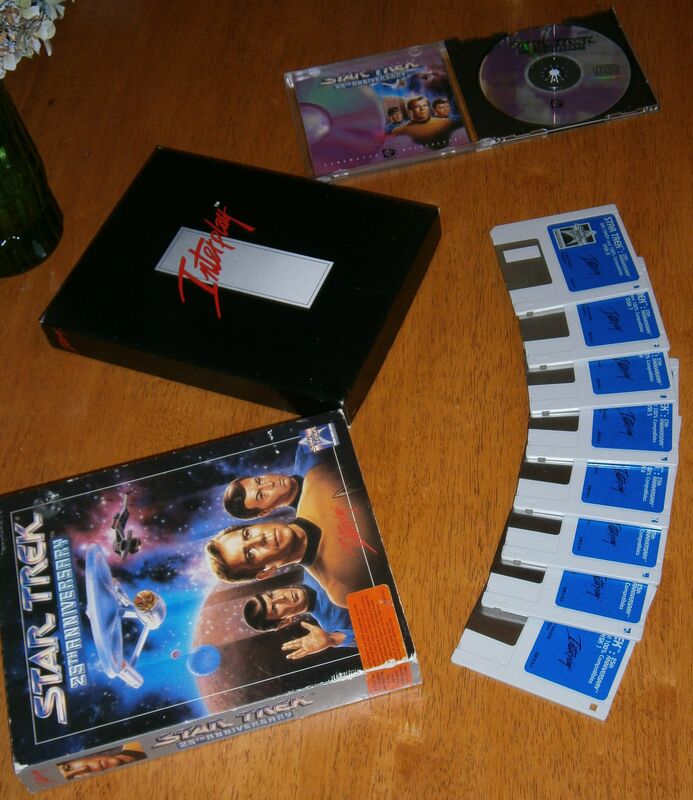 Ben: Followed your instructions carefully for Star Trek 25th using DBGL, but I only have the CD not floppies version. DBGL is fine. This game appears to not run because (per dos window) the game is looking for a CD to be in the CD drive. But need this to run from the hard disk instead because of physical disability makes it hard to always be putting cd’s in and out of the drive bay. Is the CD game version hardcoded to only run from CD bay? Please reply to my email… Thanks for your gaming blog, it’s great, I enjoyed all your gaming entries. Have you still got your copy of this game on floppy? I know this is an old posting but hope you could help me. I have just tried to install my copy of 25th anniversary, but my disk 8 is corrupt! Could you do me a favour and do am image copy & email it to me?